Today, Veneto is one of Europe's most dynamic economic realities. And all this did not happen merely by chance but has its roots in the particular historic and geographic course of this land, which we will endeavour to briefly illustrate. The region of north-east Italy, proceeding from the Adriatic Sea to the Eastern Alps divide, is Veneto with Friuli-Venezia-Giulia to the east and Trentino Alto Adige-South Tyrol to the west. This region is situated in a strategic position in Europe because it has always been the main crossroads between the Mediterranean area and northern and eastern Europe. Already inhabited in prehistory (the mummy Otzi found a few years ago in the Alpine glaciers belonged to the Remedello culture), it was in the Bronze Age (2nd Millennium B.C.) that at first settled the Euganei people and after the Veneto people of indoeuropean origin arrived from the far-off Paflagonia (today's Turkey) after the destruction of Troy, as narrated by the Latin-Paduan writer Titus Livius. In fact, this legend is attested to by the Oriental style of their artistic activities. A part of these peoples spread throughout Europe (Poland, Southern Germany and Brittany) while a part remained in today's Veneto. material coming from the Baltic countries) to the Etruscans and Greeks, as we are told by the Latin writer Pliny in his Natural History. The main centre was Este, situated at the foot of the Euganei hills. Other important towns were Padua, Vicenza, Verona, Treviso, Altino, Montebelluna, Asolo and, in the Piave valley, Mel and Calalzo in Cadore. It is believed that they were federated together, there being no accounts of any ruling kings or leaders. And all this until around 200 B.C. with the arrival of the conquering power of Rome with which, in order avoid destruction, they preferred friendly agreements. The region was soon 'latinized' and under Emperor Augustus became part of the empire with the name 'Decima Regio Venetia et Istria'. There followed a prosperous period of about 300 years which favoured the arts and trade. with a survival economy. On the other hand, free Venice began its glorious adventure on the seas, though having to constantly defend itself against the attacks of Franks, Slavs, Hungarians and even the Normans. At the time of the first Crusade (1100 A.D.) it was together with Genoa, its rival, a great seafaring people. A flourishing trade between the East (Constantinople, Egypt, the Holy Land), Italy and Northern Europe ensured the city's prestige and riches. With the traveller Marco Polo, Venice became the first to reach China and the Far East. Later, the Venetians John and Sebastian Cabot explored the coasts of North and South America, and Pigafetta (from Vicenza) accompanied Magellan around the world. Meanwhile in the hinterland the towns gradually freed themselves from feudal rule to become free cities but still fighting against each other (Padua against Treviso, Treviso against Belluno, Verona against Vicenza). Taking advantage of the situation, around the year 1400 Venice once again managed to gather under its dominion the entire territory of the 'X Regio Romana', after about a thousand years! Towards 1500, Venice was at the height of its grandeur, the 'New York' of the period, and for this continually attacked by the other European states which were jealous of its power. With the Cambrai league half of Europe was waging war against Venice which though defeated managed to save itself. Furthermore, it had to resist an on-going war against the Turks of the Ottoman Empire with whom Venice also fought and traded at the same time. In the famous Battle of Lepante, where the Christian fleet finally destroyed the Turkish fleet, most of the ships were Venetian. The following centuries until 1800 were centuries of peace and prosperity for the entire Venetian Republic. The arts enjoyed a Golden Age; especially painting with the Venetian School: Titian, Giorgione, Veronese, Lotto, Carpaccio, Tintoretto, Bellini, Pordenone, Jacopo da Bassano, Canaletto, Tiepolo and others. Architecture flourished with Longhena and with Palladium the creator of the famous Veneto Villas; literature with Goldoni and Casanova; sculpture with Canova, and music with Vivaldi, Monteverdi and Tartini. And all this while the Venetian Republic was on its way towards slow decline, until the arrival of Napoleon who brutally put an end to the millenary Republic, plundering it and then handing it over to Austria. For approximately 60 years Veneto remained under Austrian rule, but not without epic uprisings. wines, Veneto has returned to being what it has always really been for 3,000 years: a bridge between Mediterranean Europe and the rest of Europe and the other continents. 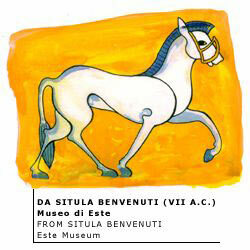 Therefore, long live the "Cavallo Azzurro" (Blue Horse) and the winged Lion of St. Mark.